8 "Dear Friend to the Muslim Community"
Dale Edward Kildee (born in Flint, Genesee County, MI, September 16, 1929) is a Democratic member of the United States House of Representatives, representing the 5th district of Michigan. Graduated from St. Mary’s High School, Flint, Mich., 1947; B.A., Sacred Heart Seminary, Detroit, Mich., 1952; teacher’s certificate, University of Detroit, Detroit, Mich., 1955; graduate work, University of Peshawar, Pakistan, 1958-1959; M.A., University of Michigan, Ann Arbor, Mich., 1961; teacher. 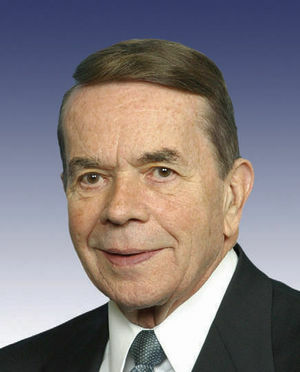 Member of the Michigan state house of representatives, 1965-1974; member of the Michigan state senate, 1975-1976; delegate to Michigan state Democratic conventions, 1956-1977; delegate to Democratic National Conventions, 1968 and 1984; elected as a Democrat to the Ninety-fifth and to the seventeen succeeding Congresses (January 3, 1977-present). Member of Optimists, Urban League, Knights of Columbus, Phi Delta Kappa (national honorary fraternity), and American Federation of Teachers. A life member of the National Association for the Advancement of Colored People. Other signatories included Tom Hayden, Jane Fonda, Communist Party USA front Women for Racial and Economic Equality, Robert Borosage, Richard Barnet, and Marcus Raskin of the Institute for Policy Studies, and the radical New American Movement and the Campaign for Economic Democracy. Kildee has recieved $38,500 in campaign contributions from the Service Employees International Union. "Dear Friend to the Muslim Community"
"He has already garnered many key endorsements, including the AFL-CIO, the UAW, the Michigan Education Association, the American Federation of State, County and Municipal Employees, and two individuals who are dear friends to the Muslim community, Congressman Dale Kildee and former Congressman David Bonior." As at September 24, 2010, the Political Action Committee of Veterans of Foreign Wars endorsed Sander Levin in his campaign for office. This page was last modified on 25 May 2014, at 12:15.